In January 2012 we had recently said good-bye to our first baby, Natalia, and we were waiting on the social services to send us another baby.... any day. When days rolled into weeks, we disappointingly entertained the idea that perhaps this would be a forty-day time of testing and waiting. Well, we were right about the testing and waiting, but way off on the timing. We actually waited close to ten months for God to bring us our next babies. During this time we kept busy putting some finishing touches on the home; one of those touches being landscaping. We were limited to what we could plant because our leach lines run under every inch of dirt around us. So we settled on some giant pots that could be placed around the perimeter of the property. We thought it would be both fun and practical to fill the pots with fruit trees. So, with zero "fruit tree experience", we picked up nine bear-root trees from Costco. Even our friends from British Colombia who helped us plant the trees were skeptical that the two-foot twigs would ever show any sign of life, much less fruit. Donna Werdenie, a missionary who lives and serves at GBH, was certain our trees would one day produce fruit. She made index cards with scripture about bearing fruit and walked by the trees several times a day asking God to make them fruitful. During extensive times of prayer and seeking the Lord for the ministry, we began to feel like our tiny little fruit twigs were somehow symbolic of our faith journey at GBH. By spring of 2012 the trees had leaves and flowers. By summer we had a couple very small, uneatable nectarines and pears. This spring most of our trees produced beautiful blossoms and we are anticipating some fruit. Observing the trees change through the seasons and mature over time, we do see a little of our journey in theirs. We can only reap what we have sown. We can not expect avocados when we did not plant any avocado trees. At GBH the fruit of our labor are lives transformed by Jesus Christ. Specifically, He has given us a vision for healing. The seeds that we sow are specific to the fruit that we expect to bear. The greatest healing seed we sow is prayer. We pray every day for miracles of healing in our babies. Others include education and training, nutrition, small adult to child ratio, planned sensory activities, and play that promotes healing. There is much effort that must be expended before fruit can be enjoyed. Our trees need to be watered. We've had to replenish the soil in the pots several times. They need to be fertilized and sprayed for pests. Branches need to be pruned and weeds need to be pulled. So it is with our faith journey at GBH; fruit doesn't just happen, it requires a great deal of effort. Effort is labor, and labor is most often difficult and unrecognized. For every one smile, giggle, new word, first step, and connection of trust, there have been hundreds of bottles made, diapers changed, sleepless nights, interrupted naps, rejection of homemade food, loads of laundry, spills, and oh-so-exhausting tantrums. Only those who tend the tree, and the Maker of the tree, know the depth of labor represented by a beautiful blossom or savory fruit. Bearing fruit takes time. Many months pass with the appearance that nothing is happening, until one day you look out and see that the tree is covered in tiny little buds. 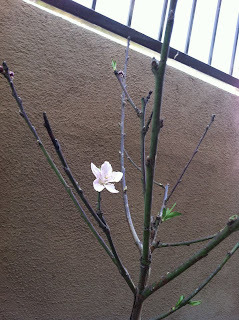 Then one day you notice a beautiful little flower. After the tree is in full bloom you begin to recognize tiny little fruit replacing the blooms. Then begins hopeful expectation while you watch the fruit grow and ripen. At GBH, we know what it feels like to watch for many months while seemingly nothing happens. We know the beauty and fragrance of those first smiles. We rejoice over the fruit of our labor when we are eye witnesses to healing. But there is no instant fruit and there are no shortcuts to speed up the process. So, as we look out our window and see what used to be tiny little twigs beginning to produce fruit, we rejoice in the similar journey that God has our GBH family on. Through much labor and long periods of hopeful expectation, we too are beginning to see fruit in the lives of the precious little ones under our roof.